Siri might be the closest we've come to HAL 9000 or the Enterprise's computer in Star Trek, but ultimately, you're still just talking to a phone. 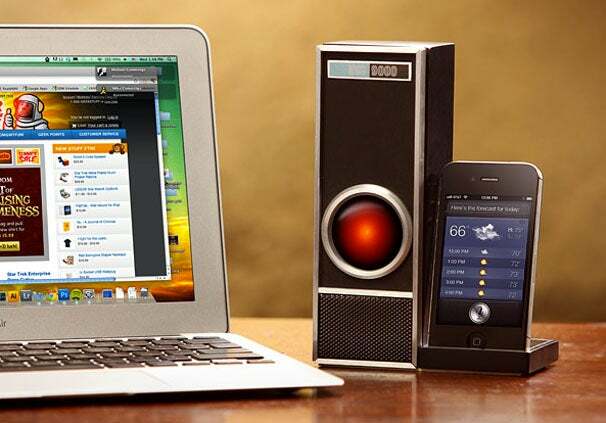 Fortunately, ThinkGeek lets you better simulate the effect of talking to a futuristic intellifent agent wit the IRIS 9000. The IRIS 9000 is an accessory for Siri that has a retro-futuristic vibe, and it lets you activate Siri from anywhere in a room. Simply place the iPhone 4S in the cradle, press the remote to activte Siri, and the built-in microphone in the IRIS will relay your command from up to 50 feet away. IRIS also doubles up as a speakerphone, so you can make phone calls without touching your phone. The best thing about the IRIS which would make it totally worth the money? The big red eye in the middle glows alongside Siri's voice. Imagine how cool that would look in the dark. Unfortunately, you do still have to open Siri with the press of a button, but it could be useful if your iPhone is charging in its cradle on the other side of the room. Also, you still won't be able to open the pod bay doors. The IRIS 9000 will set you back $60, and it works with the iPhone 4S. You can pre-order one now, but it won't ship until sometime in 2012.